This is a well-written and entertaining book. There are plenty of twists and turns throughout the story that will keep you guessing the identity of the killer. Even so, don't read this expecting a mile-a-minute thriller and a shocking discovery at the end. You're not likely to gasp and say "Oh no - not himher!" when the killer is revealed. The cover of this book compares it to other "English village cozy" mysteries and that's exactly what it is. The little Welsh town of Llanelen is too small for cliffhangers (so to speak). You'll get a nice picture of village life at Christmas time while Penny Brannigan solves a murder and opens a new spa. Now for the bad. This book is way, way overpriced in my opinion. It's what I consider a light read - a really light read. At 273 pages plus a few lines, it's not very long and, for me, is a couple hours' read. Yet the paperback is priced at a whopping $15.66 and the digital version at $11.99. Someone is dreaming grandiose dreams here. Let me provide a reality check for the publisher. The cover of the book compares it to other mysteries, such as Dorothy Cannell's - the most expensive of which is $7.99 for a paperback or digital version. There is also a comparison to Nancy Atherton, who has one outrageously priced book ($11.99 for the digital version) and the rest are $7.99 and under. See where I'm going here? If there's a comparison between an author priced at $11.99 digital and an author priced at $7.99 digital - which one do you think is most likely to be read? And mind you, I think $7.99 for digital is still overpriced, but it's at least more reasonable than $11.99. Let me put it another way - for $12, I can go spend a couple hours at a movie and be entertained for approximately the same amount of time it took me to read this book. 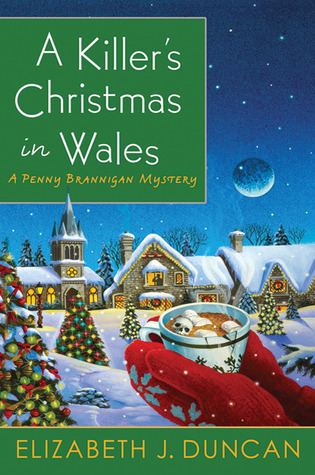 Sign into Goodreads to see if any of your friends have read A Killer's Christmas in Wales.